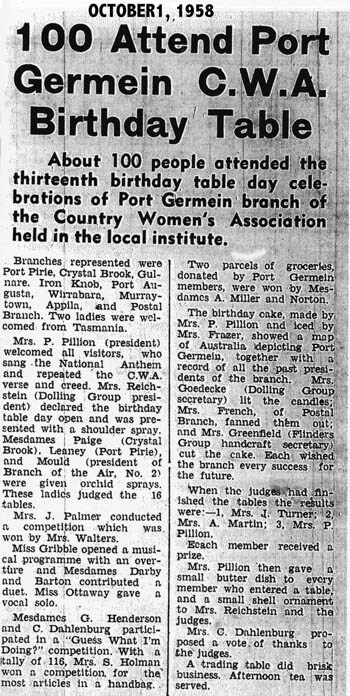 To celebrate their Ruby Wedding the members of Mr. and Mrs. S. Henderson's family tendered them a special party at the home of Mr. and Mrs. M. Ramsey, at Baroota. About forty-five guests were present and Elaine Ramsay preented a shoulder spray to her grandmother and a button hole to her grandfather. Mrs. Henderson looked charming in a frock of blue floral silk, while Mrs. M. Ramsay chose a nylon frock of lemon floral. Mrs. L. Henderson favored navy and white polished cotton, while Mrs. G. Henderson looked gay in green floral. During supper Mr. and Mrs. Henderson cut a three-tiered cake, of which a tier each had been made by Mesdames L. Henderson, G. Henderson and M. Ramsay, and it was iced by Mr. L. Henderson. Many gifts were received by the charming couple, including a wall clock which was given by the members of the family, and a number of telegrams were also received. Among those who spoke in glowing terms of the celebrants were Mr. L. Henderson, Mrs. S. Johnson (Kimba), Mr. Johnson, Mr. W. Spencer and Mr. H. Williams (Brooker). Guests came from Baroota, Mambray Creek, Telowie, Port Augusta, Adelaide, Kimba and Brooker (Eyre Pen). * * * House guests of Mr. and Mrs. S. Henderson were Mr. and Mrs. S. Johnson of Kimba and Mrs. Nykiel of Adelaide. * * * Mr. and Mrs. H. Williams, of Brooker, and Mrs. Dunn, of Adelaide, were guests of Mr. and Mrs. G. T. Henderson.